How to cook the best, juiciest pork tenderloin in under 30 minutes. 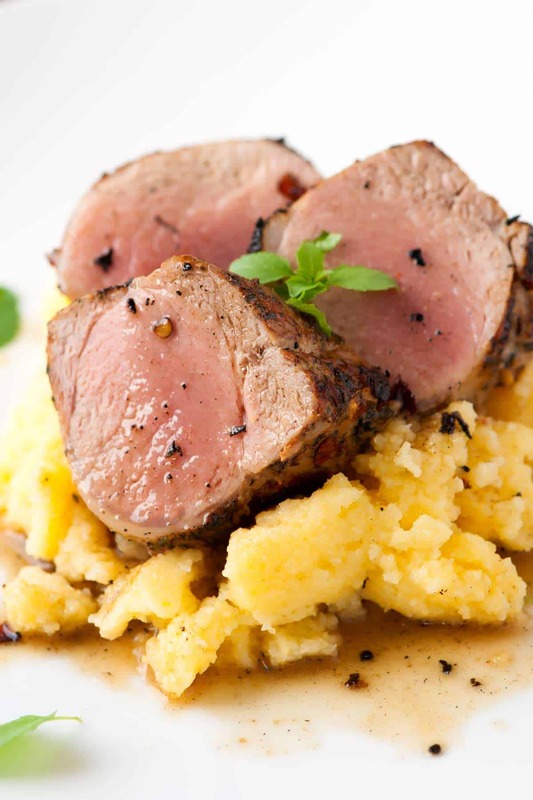 Jump to the Easy Roasted Pork Tenderloin Recipe or read on to see our tips. We like simple recipes. That’s why this roasted pork recipe is a favorite around here — You need a hot pan, spice rub or herbs and pork tenderloin (also called pork fillet outside the US). Try our recipe for making the BEST, juicy skillet pork chops or if you prefer to bake them, here’s our recipe for oven baked pork chops. This recipe for pork tenderloin with apples and onions has so many happy reviews. Pork tenderloin is lean and has almost no fat. So keeping it moist and juicy can be tricky. That is unless you know these steps for the most succulent roasted pork tenderloin. MORE: We use the same method when making our Roasted Pork Tenderloin with Peppers and Onions. You don’t need a specific recipe for this, only the steps for cooking it best. The flavors are up to you — we’ve given a few suggestions below. For the best pork tenderloin, pat the pork dry then liberally season with salt and pepper. Patting the meat dry helps the salt and pepper to stick. It also means less sputtering in the skillet when you brown the meat. Before roasting, we always sear the pork on all sides first. After seasoning, throw it into a hot pan — we love our cast iron skillet for this. Sear all sides until they are golden brown. It’s okay if the pork is still raw in the middle. When the pork is browned on all sides, it’s ready to slide into the oven. If you’re using any herbs or seasonings, now is the time to add them. You could have added herbs before searing the pork, but that risks buring them. By adding them after searing and before roasting, the herbs will add flavor, but won’t turn brown and bitter. To finish cooking the pork, we slide it into a hot oven. We keep the oven temperature high and roast the pork for 15 to 20 minutes. Cook pork until an internal thermometer inserted into the thickest part registers between 145 and 150 degrees F. That will mean that the pork will be juicy and slightly pink in the middle. If you’re not a fan of the pink, cook a little longer, but be careful not to overdo it. In our Easy Lemon Chicken Recipe, we use the same method: Season, sear, and then finish in the oven until cooked through. It makes chicken that’s perfectly cooked and juicy with crispy skin. 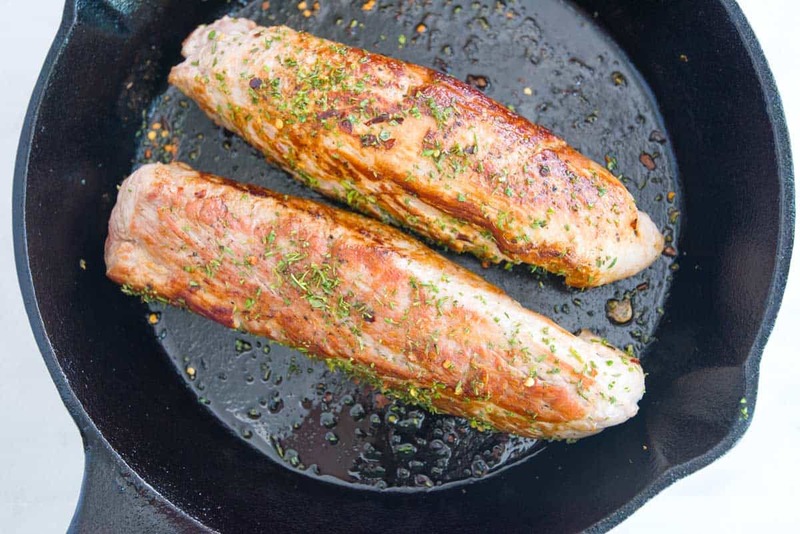 For the juiciest pork tenderloin, make a quick pan sauce. To do this, using the same skillet you cooked the pork in, add about 3/4 cup of liquid. You could use apple cider (that is what we did), wine, chicken stock, vegetable stock or even beef broth. Cook that liquid until reduced by half then swirl in a tablespoon of butter. You may already have a bunch of half-used spice rubs in your pantry, here are a few suggestions for how to use them in this recipe. Our recipe calls for three things: pork, spice rub, and a deglazing liquid for making the pan sauce. For the best, juiciest pork tenderloin, sear the pork on all sides in a skillet before finishing in the oven. The spice blend you use is up to you; we love using a spicy steak spice blend or fresh herbs like rosemary and thyme. We love to serve this pork over polenta or mashed potatoes. Heat oven to 425 degrees F. Trim each tenderloin of any silver skin (this can be tough when cooked. Use a small sharp knife and slide the blade under and outward to remove it). Pat pork dry with paper towels. Then generously season with salt and pepper. Heat a tablespoon of oil in a large cast-iron skillet or heavy-bottomed oven-safe frying pan over medium heat. Add the pork tenderloins and cook, occasionally turning, until browned all over, about 2 minutes per side. Scatter the seasoning blend or herbs over the pork. Roast 10 to 15 minutes or until an internal thermometer inserted into the thickest part registers between 145 and 150 degrees F.
Transfer pork to a large plate and cover with aluminum foil. Let rest about 10 minutes. While pork is resting, place the skillet back over medium heat. Add the apple cider and simmer until reduced by half. Add butter then serve drizzled over pork. When is Pork Tenderloin Done? We cook our pork to 145 degrees F. This means the pork will be barely pink in the middle, safe to eat, and ultra juicy. You can cook pork tenderloin to anywhere between 145 degrees F and 160 degrees F. Just keep in mind that keeping it as close to 145 degrees F will result in the juiciest, most tender piece of meat. This was the most delicious pork loin roast cooked this way and the gravy was excellent! Thank you for this recipe! Since we use a cast iron pan (or oven-safe pan) to sear the pork in, we do use it for finishing the pork in the oven. 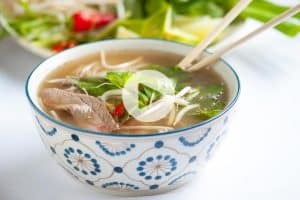 This is my favourite type of recipe – easy, versatile, and delicious! It can be easily adapted to personal tastes, or to use whatever ingredients are on hand. 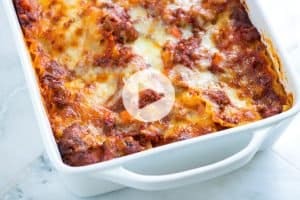 So glad I found your site, and I’m looking forward to browsing more recipes! Had this for dinner …I will NEVER cook pork any other way … OH MY WORD …. Thank you for sharing . This makes a terrific pork tenderloin every time! This sounds like a very good and quick recipe. However, I have a question. Your recipe calls for a 1-1 1/2 pound tenderloin. When I get my pork loin, it is usually 4-5 pounds. How long would you have to roast this size of a loin? Hi Jan, Pork loins and pork tenderloins are different. Pork loin is a larger piece of meat. That said, you can adapt this recipe for your pork loin. Since it’s larger, it will need to roast longer. I’d still sear the outside in a pan and then roast it in the oven until cooked though (about 1 hour). It has been a while since I made a pork loin and I was just wondering how long it should take. I have always seared the meat in a skillet before roasting it but 1 hour doesn’t seem like very long for such a large piece of meat, then again 10-15 minutes doesn’t seem very long for a 1-1/2 lb. piece of pork either. Sorry, but I don’t want to try to have the loin ready at a certain time and then have to wait twice or triple the time for it to finish. Hi Jan, Is your pork loin bone-in? Sorry it took me so long to reply. No, I try to always buy the pork loin when it is on sale and I always buy the boneless. I am not a good cook but the simplicity of this pork loin recipe was perfect and it came out absolutely delicious!! Thank you for sharing and will definitely use this recipe again! Made it tonight- for the rub, I used Weber’s Garlic and Jalapeno. For the sauce, I got a can of apple juice (condensed) with 2 cups of water, and some green chile (hot- from New Mexico). It was a little bit sweet, a little bit sour and a little bit hot. I made enough so we could have leftovers tomorrow and it was so SO good. No leftovers😠😋 for the sides I did green beans and roasted potatoes. Hi Ray, You could try our homemade mashed potatoes, these roasted carrots or for a lighter option, mashed cauliflower. I agree with the roasted carrots; they’re wonderful with pork. 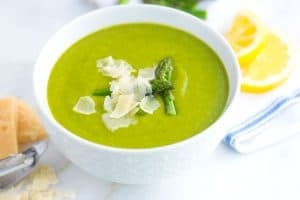 You may also try small roasted potatoes or sweet potatoes,or even roasted asparagus which you can roast along with the carrots (the temp is 425 to roast, so no changing temps). If you want cold sides, try a cucumber salad, or Caprese salad (easy & quick tomato, mozzarella, & fresh basil salad), corn & black bean salad, or even potato or macaroni salad. Making this for a second time! Absolutely delicious with the suggested apple cider pan sauce. Served with sautéed spinach and roasted garlic parm. Cauliflower mash. Very tender and juicy. We make this recipe all of the time. 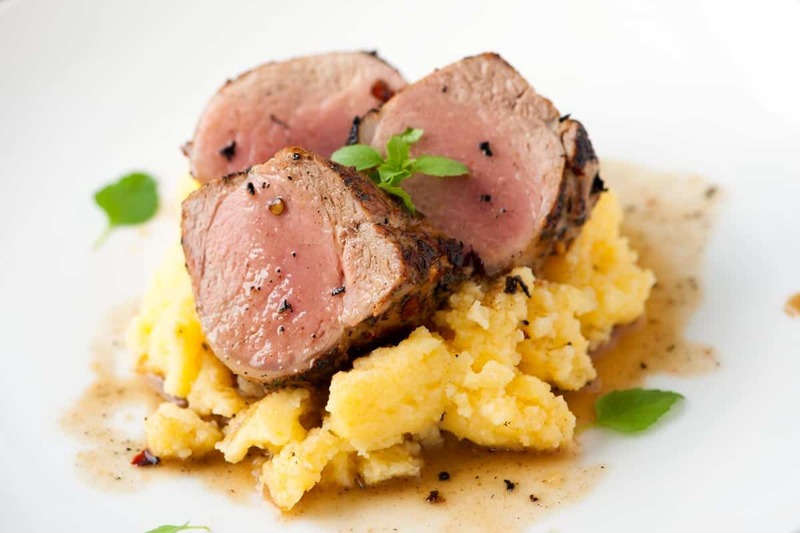 The go to recipe for pork tenderloin. Could I use a small pork loin instead of tenderloin? Hi Pat, You can use a small pork tenderloin, just keep in mind that the pork will likely take longer to bake. Simple and delicious! I made it with McCormick’s reduced sodium seasoned salt! Made the sauce with apple juice and a little Wondra slurry! Served it with mashed potatoes and roasted green beans! This was probably the most tender and delicious piece of meat I have ever cooked! I used a sage rub and used apple juice to make the sauce. It was fabulous!!! My husband, a very particular eater, flipped over this roast. Tender,juicy,delicious! Made this tonight! So good! It was a hit with my family:) I added a bit of cornstarch to my sauce, to make it more gravy like. I also added fresh mushrooms to the sauce to kick it up a notch. Yum! Will be making again! wonderful video. I am going to do that for supper right now. Thank you. What can you use if you don’t have a cast iron pan? Hi Angela, Any oven-safe skillet will work. 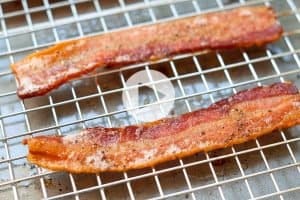 If you do not have one, you can brown the pork in a skillet on the stove-top then transfer it to a baking dish or sheet pan to finish it in the oven. So delish! Definitely a hit with my fam. Super easy! I used chicken broth and beef grill dust for my seasoning. I had to roast mine for about 20min to get it to temp. Looking forward to making it again…thank you for the recipe!